Much has been written recently about the healthy virtues of eating more fruit and vegetables. “Five a Day” has been the slogan for the last few years, although all the evidence is that not many people manage to reach that goal. Now the latest Government advice is that “Seven a Day” would be a better target! To read more on this subject, click on “EMFV” in the TAG CLOUD. An apple a day. Easy to do, easy to buy and does not deteriorate quickly, so a weekly shop will do. Could also be the saving of the Health Service, if an “apple a day keeps the doctor away”. There will be less pills taken and lower admissions to hospital. Also no cooking involved so helps save the planet in terms of energy conservation. Several virtues into one. Don’t peel the apple because the skin contains most of fibre and that’s good for you. 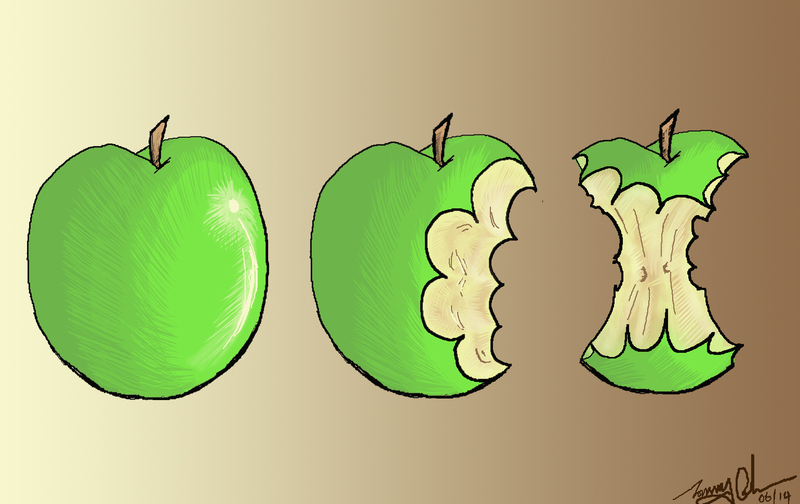 However, be careful, if you no longer have your own teeth, you may have to chop the apple into little pieces so you will miss the “crunch” of the advertising campaign. Eating more fruit is already beginning to transform my world. See what vegetables can do in the next blog. This entry was posted in HEALTH and tagged "EMFV". Bookmark the permalink. one old ‘fruit’ to another: Its ‘GREAT’ all though I like mine stewed and in a crumble with ouddles of custard and ice cream! Does that count as the solidier in the desert said to his camel, as he smoked his last cigarette? ( Motto its the tabacco that counts- Capstan or senior service: But that was a long time ago). I am still hear and my fruit awaits me???? Now veg is a different matter! I like my greens, but not spinach Too soft and watery, a good bit of cauliflower, , a stong green cabbage- a little taster while raw, peas, brussel sprouts, a few carrots of couse if i am off colour ‘Hewie sees the remants of my carrots? Not nice. Brocolli, wonderful, and my Roots well swede, onions, beetroot and off course the odd potato, but not parsnips they are too strong in taste for my delicate taste buds, and off course salad all those bright colours one can feast with ones eyes: Those peppers, lettice, cucumber,water cress, tomatoes,spring onions, raddish, beetroot again, all with a dolop of mayonaise, wonderful. I am thinking also of mustard and cress- Nice strong and gentle in flavour, Full of iron- Makes me think of that ‘ Old Fruit’ who constructs these blogg pages- Strong gentle but reliable- ‘A Good Old Fart’? full of wind after eating all this fruit and vegs??? Bye Bye for now, Regards.